But somehow it doesn't matter, as rarely there has been a game with so much totally indulgent charm (an afterword to the rules even states that playing the game actually creates the game world for real somewhere, and that our world can - vice versa - be saved when playing it as well). If you understand the rules (which are poorly organized) you can actually find a lot of tactics in the game - it's not the dumb dice fest that you first think it will be. Where the game wins you over in the end though is in the atmosphere department - for some reason the "Wizards" world REALLY becomes real, and rarely has there been a game where winning really makes you smile BENEVOLENTLY instead of gloatingly. 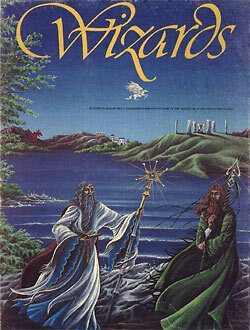 A rare fantasy gem of the early 80's this has to belong in any fantasy gamer's collection.